First of all I apologize for the delay in posts! However I will get more up in the next few days that will cover many topics! I'll continue with real food challenge updates and discuss the ingredients used in our baked goods and explain why we use them over others. In this post I want to share a few foods related to our family's challenge. The photo to the left is our dinner two nights ago. The bread, tomato, lettuce and cucumber were all purchased from local farmers. 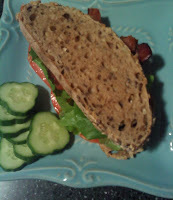 We added some bacon and had a filling BLT for dinner. It's refreshing to taste the food we are eating. Ever buy produce from the local grocery? It was picked too soon and not allowed enough time to ripen on the vine to reach its full potential! The flavor of a fresh, local cucumber and tomato just can't be duplicated! This is a meal I made out of another bakers bread, the best hummus I've ever eaten and some green lettuce. So far you've seen a lot of bread which isn't quite the norm here but we've had two meals this week that consisted of the breads in these photos. One thing I love about our local bakers is their grains are fresh ground, some have no yeast or gluten, low sugar (if any), no HFCS and no preservatives.